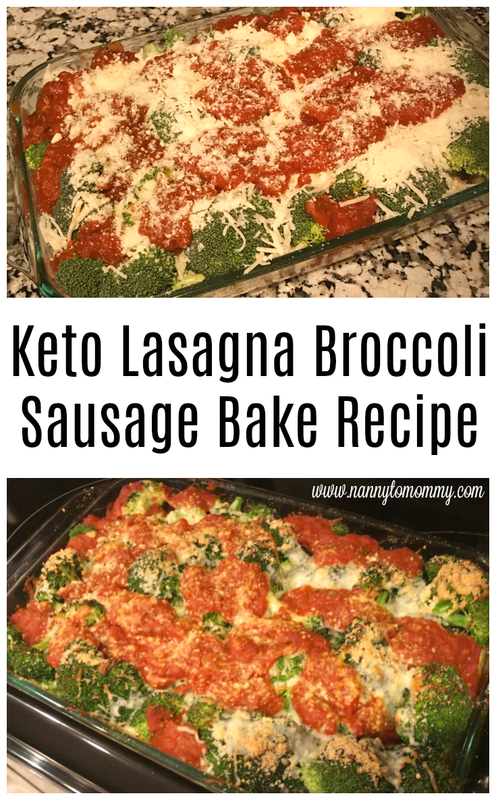 I created this easy keto lasagna broccoli bake recipe so my family could have a delicious meal time without too much fuss. 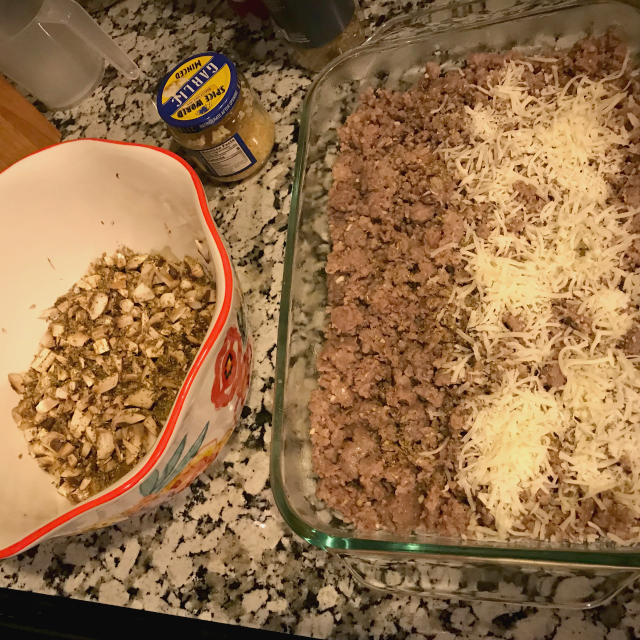 My husband has been focusing on the low carb diet called ketogenic for over two years now and within the past year his family has started living this lifestyle as well. My mother-in-law is at her goal weight after years of not being able to lose any weight. She also did intermittent fasting. What I love about this meal is that you can prep it ahead of time for an easy pop in the oven family dinner idea. I also love that there are left overs to make for easy meal prep. It also re-heats really well. The funny thing about how I came up with this recipe is, my husband bought a bunch of sausage brats on sale and we froze them. I saw them in the freezer after not being able to find any chicken and thought, "I bet I could throw something together with those". I searched a few recipes on Pinterest, but didn't see exactly what I was looking for based on what we had on hand. So this easy family recipe was created! And I wanted to share because it was definitely a crowd pleaser! 1. Pre-heat oven to 450. 2. Brown sausage in pan with olive oil, garlic, and Italian seasoning. 3. In separate bowl, mix 1 tbsp. Italian seasoning, eggs, and mushrooms (and other veggies) in bowl. Add browned sausage meat. Mix together. 4. Spray 3 quart oblong baking dish with cooking spray of choice and add ingredients. Layer with mozzarella cheese and parmesan cheese. 5. Then top with enough broccoli to layer dish. 6. Spoon on spaghetti sauce (I bought mine pictured from Kroger, but I also found some on Amazon), and top with rest of mozzarella and parmesan cheese. 7. Heat for 20 minutes at 450 or until egg mixture is cooked through. This makes about 8 to 10 servings. It's full of flavor and hearty. If you are going to start the ketogenic diet, I needs to be a lifestyle change. You also make sure that you set yourself up for success with the right tools. 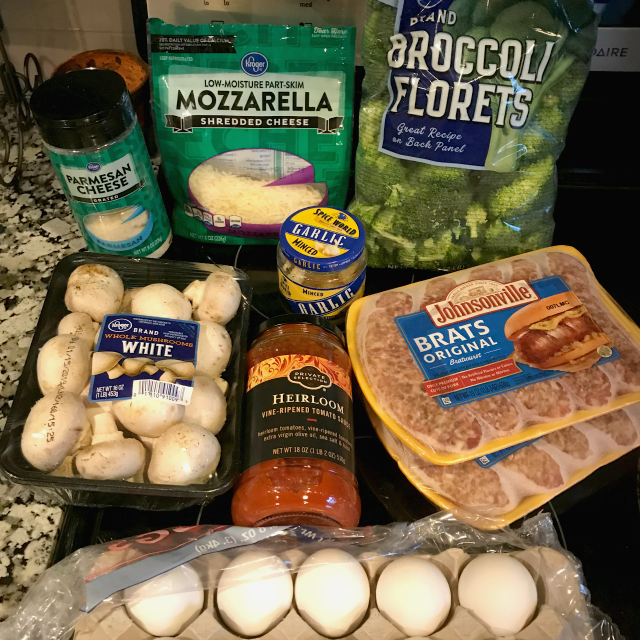 My friend at Mama's Geeky has a great Keto Shopping List for Beginners. Pink salt and drinking water with added electrolytes can help when "keto flu" sets in or cramping. To learn more about the ketogenic lifestyle, here is a detailed beginner's guide to the keto diet. I was looking for something and came upon this recipe. It looks delicious and I believe as a diabetic I can have everything in it. My daughter does most of my cooking so I sent the link on to her. Thanks for posting! It does look really good! I know so many people doing keto diets, it would be great to have recipes to share with them. Great recipe. I might try this with cauliflower. This looks really good. I'm always looking for recipes that use broccoli. I'm always looking for low carb meals to feed my family. I can't wait to try this one! This is such a nice recipe. I will make this for my family.